MERRY CHRISTMAS EVERYBODY!! The day has finally arrived! I hope Santa brought you everything you asked for, but most importantly, I hope you are enjoying your day. I personally feel that this is what Christmas is really about, we need to enjoy it as much as possible because it is one of the few occasions in which we can relax, spend time with the family and have a lot of fun and a lot of food too. I guess we all do pretty similar things during Christmas, but today I wanted to share with you all what I normally do on Christmas day, and I hope you find this interesting. We tend to start the day having a good ol’ breakfast such as churros or maybe some pancakes. I feel like this is great, although it is not very healthy, especially after the unhealthy dinner we had on Christmas Eve. 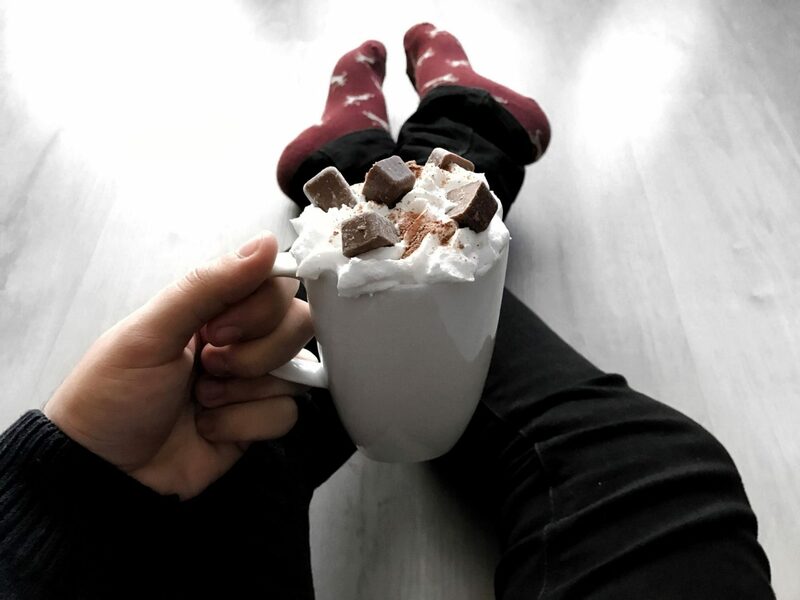 I think it is also a must to have some hot chocolate. I like mine with a bit of cinnamon, some whipped cream on top and Wispa bites. It’s too much chocolate maybe but it’s Christmas so we can treat ourselves. I normally spend my morning listening to Christmas songs just to feel even more festive. If you want to know my favourite ones, you can check them out here. I also try to catch up on everyone’s vlogmas. Normally, I’m up to date with just some, such as Zoella’s, which are by far my favourite ones because she loves Christmas as much as I do. Even though he does not do vlogmas, Alfie’s vlogs are very festive too, and they complement Zoe’s. Tanya Burr’s vlogmas is also one of my favourites. Of course, we normally have lunch with all the family, or at least some of us. This is always the best part of Christmas because we always end up spending all the afternoon together chatting or playing board games. I normally play Trivial or Monopoly, but there are so many options available. Bingo is also a classic, and it can be so much fun. Yes, it can be, although it may sound boring to you, it just depends on the people playing. In the afternoon, even though it is not what we normally do, we go for a walk sometimes. I love this kind of walks, but it is quite cold outside. For this reason, staying at home sound better to me. In the evening, we get cosy and watch a film. It is normally a Christmas film of course. Home Alone, Love Actually and Elf are some of my favourites. Let me know what you normally do on Christmas Day, I am very interested in it, as you may do some other cool things. I hope you found this post interested, although it is probably what most of the people do. However, during Christmas, I am quite traditional, which I think is great because we should care more about our cool traditions and protect them. I love hearing about what other people get up to during Christmas! We never really have breakfast, or if we do it’s likely a bar of chocolate from a selection box, in order to save room for dinner!